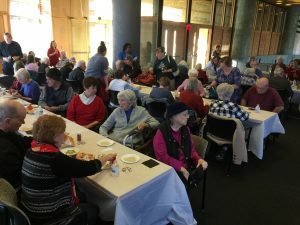 The Dementia Arts Fest celebrates art made by persons living with dementia! 1. 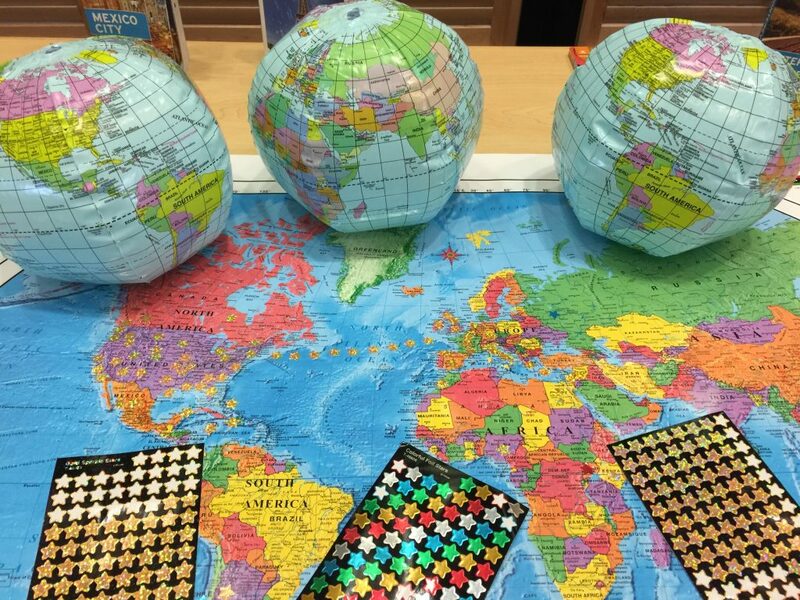 Photos of the artwork in JPEG, PDF, or PNG format. Label each image with your last name, the title. 5. Email the above information to Karen Love at karenlove4@verizon.net. Please let us know if you are submitting artwork on behalf of someone else. ▪ Artwork accepted for the exhibition may be for sale, or may be marked as ‘NFS’ (not for sale). If the artwork is NFS, artists must include a prepaid return shipment label for UPS or Federal Express with their artwork shipment. 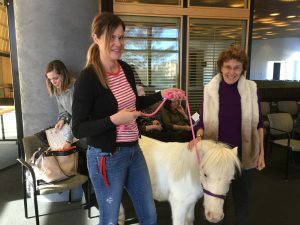 One of the stars of November’s KC Memory Cafe was a miniature horse. 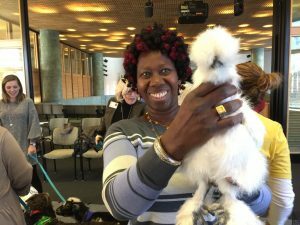 It’s not every day that a white horse and a couple of black goats visit the Plaza Library, accompanied by exotic bunnies and silky chickens. But these friendly animals, brought to us by the Paramount Petting Zoo, captivated all our attendees. “These animals love to be held and petted,” their keepers told us. They instantly snuggled into people’s arms and were in no hurry to leave. 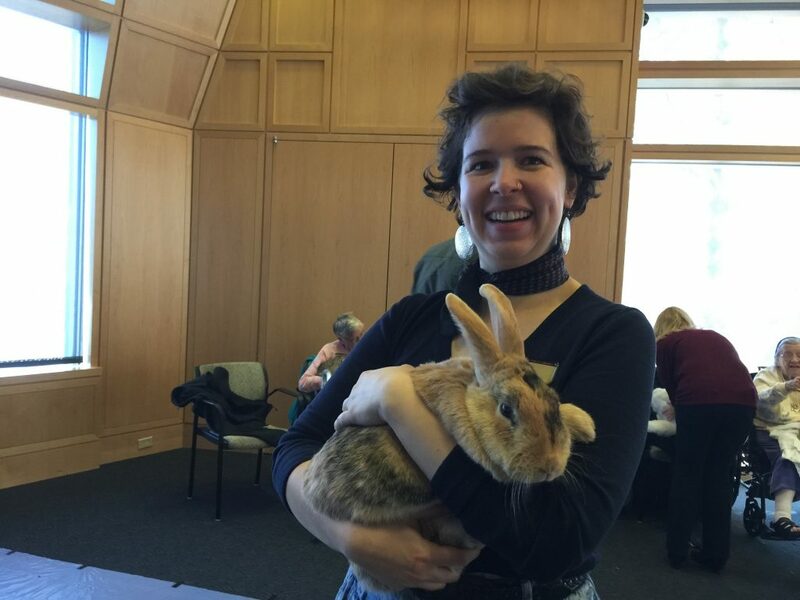 Our attendees were filled with a magical sense of connection and relaxation, mixed in with the thrill of meeting all these new animals. 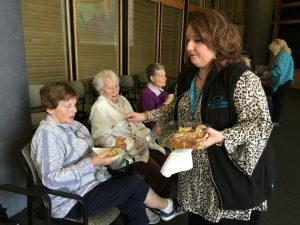 “Animals fill us with excitement, and give us something to talk about,” says Mandy Shoemaker, co-founder of Prairie Elder Care. 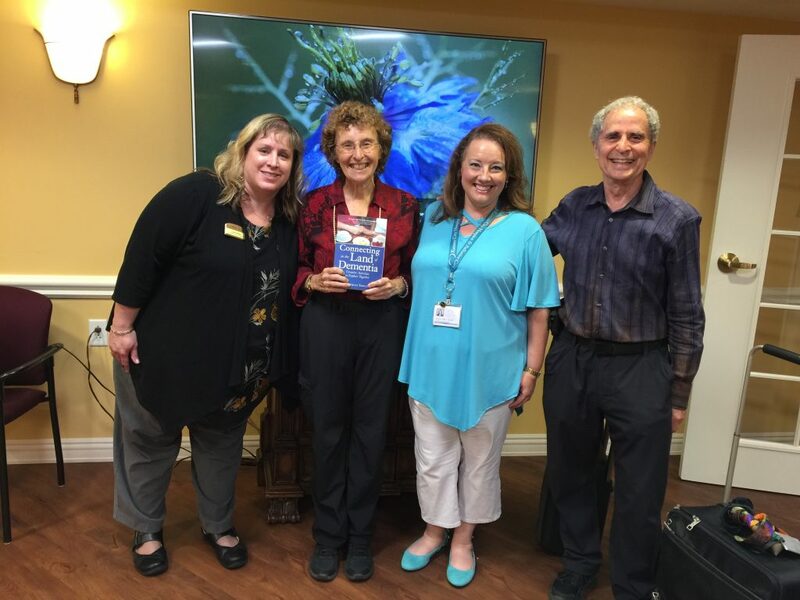 Mandy’s organization is part of the esteemed Eden Alternative, a national movement dedicated to reducing loneliness, helplessness, and boredom through loving companionship and meaningful engagement. 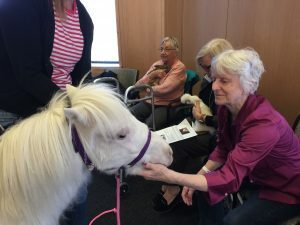 “Animals give us a connection,” she says. 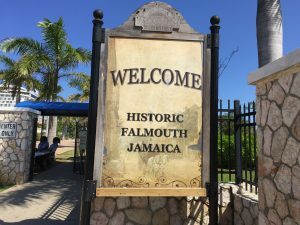 For most, it was a unique experience, one they did not tire of. 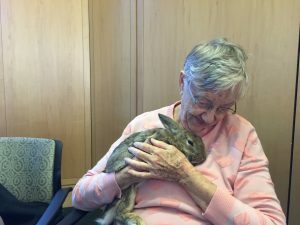 For some, parting with their loving chicken or bunny was like saying good-bye to a dear friend. To meet the animals, click here. 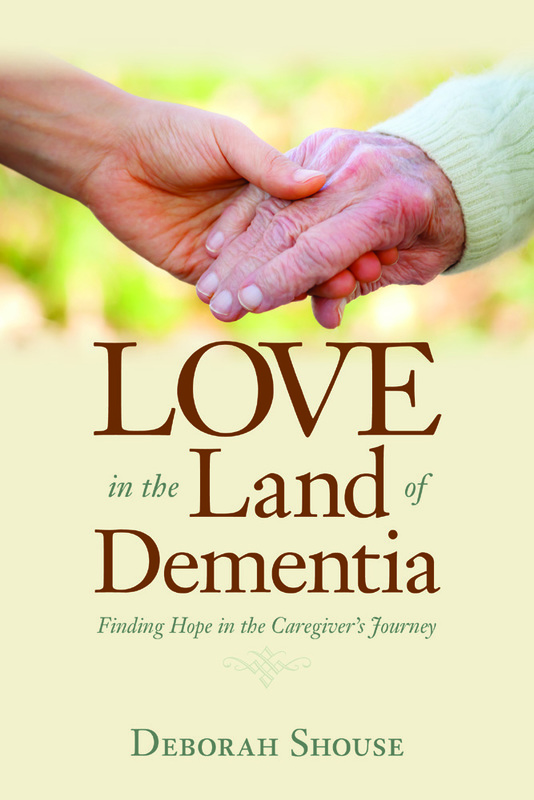 The more research we read, the more people who are living with dementia we listen to, the more care partners we consult, the more we understand the power of keeping engaged, inspired, and connected in the land of dementia. 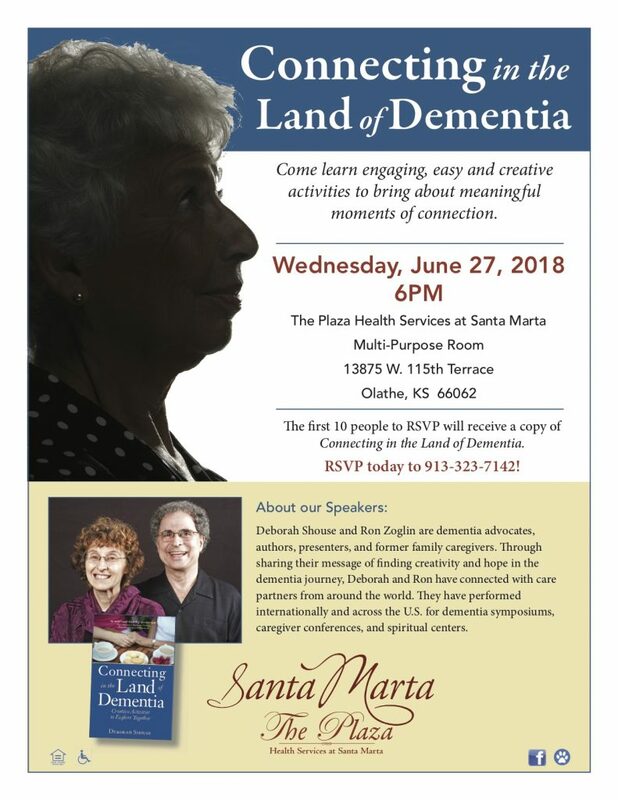 Along with Jennifer Walker, RN, BSN, Clinical Community Liaison from Kansas City Hospice, we’ll be sharing ideas for staying connected on Wednesday June 27, at 6:00 at Santa Marta. 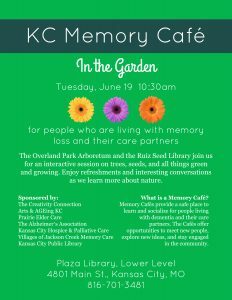 If you’re interested, please join us for this free event. 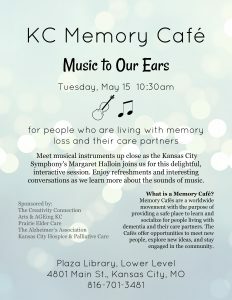 We’re also including information on two free dementia-friendly gatherings happening in June in KC. Instantly the room transformed from a quietly listening group of adults to a boisterous band of emerging musicians. One couple beat on a drum together. 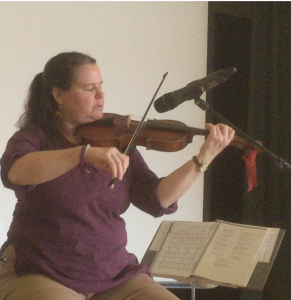 A woman tentatively held the violin. 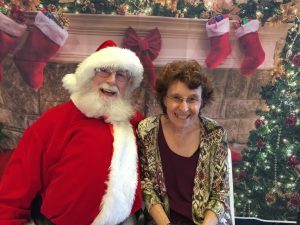 When Margaret helped her coax a sound of out it, she burst into delighted laughter. People tried the cello, the gong, the bongos, and the French horn. 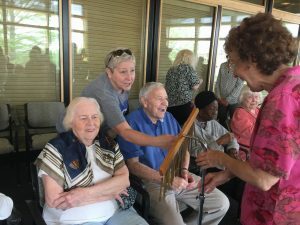 Even better than the sounds of music were the spurts of laughter and the lively conversations. After our chaotic impromptu concert, we gathered in small groups to talk about the music in our lives. One man had been a professional pianist. Several people had played in marching bands. Some had never touched an instrument. Until today. 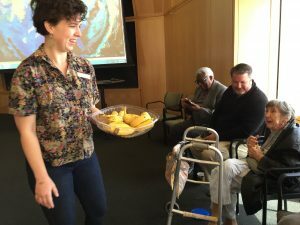 “Music is one thing that is universal and that brings us all together,” our cafe facilitator, Jennifer Walker, RN, BSN, told us. We all applauded. 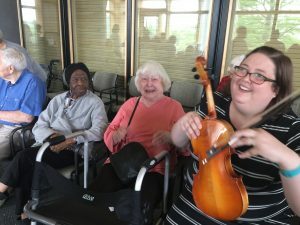 We had gone from a one-woman orchestra to a 50-person orchestra in a matter of an hour and we were feeling energized, happy, and filled with the sounds of music. Invite several musical kids/friends/relatives to come over, tell you about their instrument, and help you make a sound on it. Have fun playing imaginary instruments along with a big band or big orchestra music. Listen to favorite instrumentals and talk about any memories evoked. 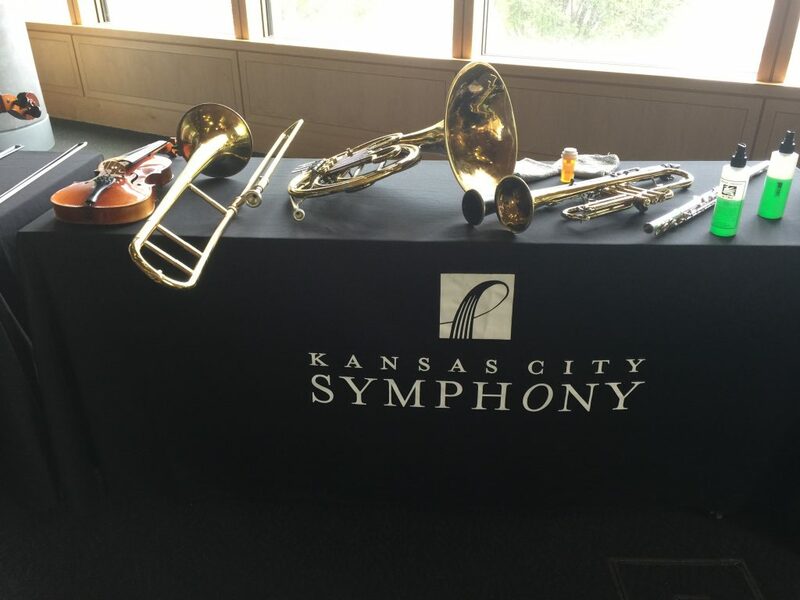 Many thanks to the Kansas City Symphony for coming to play with us. 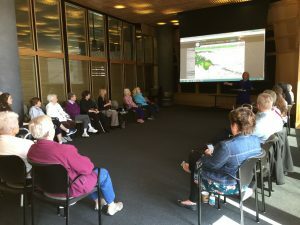 Karli Ritter is a self-described “weather nerd.” When this Fox 4 meteorologist finished her lively talk at April’s KC Memory Cafe, we all had a bit of that “weather nerd” fever in us. 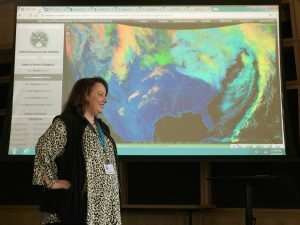 We listened intently as Karli described her early morning routine, up at 4:30 a.m., studying the weather maps and data so she could formulate a forecast. 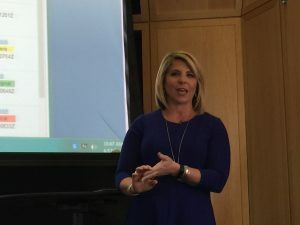 She detailed the complexities of being an integral part of a five-hour show: she actually appears on TV 90 times during the Kansas City Fox morning show! 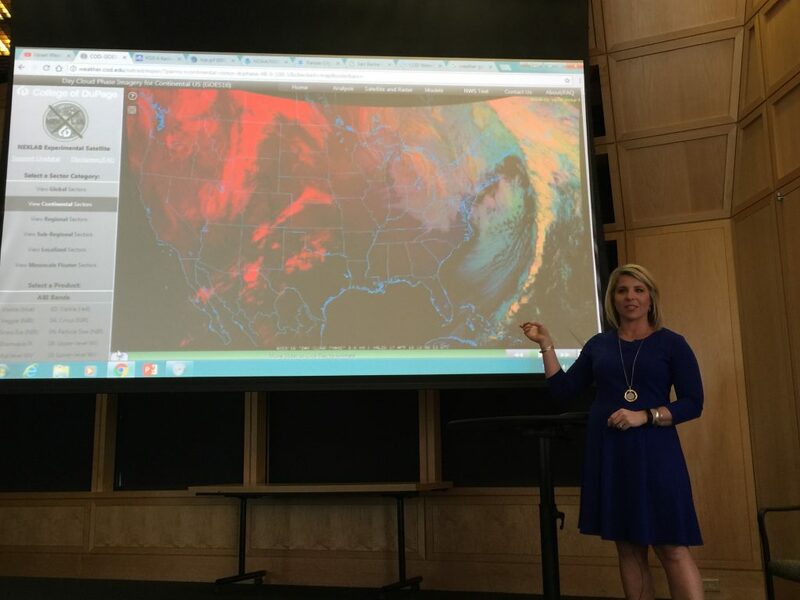 Her talk reminded us that great weather information inspires great conversations. 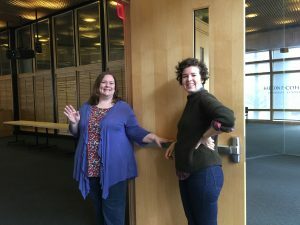 Karli has a love for storms and we were delighted with our “tornado” experience, courtesy of the Kansas City Public Library staff. We used a special coupler to link one empty liter bottle with one half full with water. Then we shook and turned it upside down and voila! a little tunnel tornado formed in the water! 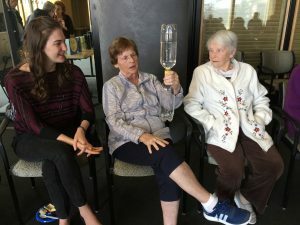 Each person was fascinated by this experiment. That led us to a conversation about personal weather experiences. 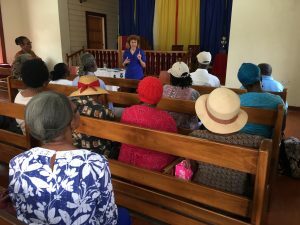 Our attendees had gone through hurricanes, earthquakes, dust storms, tornadoes, nor’easter’s and much more. 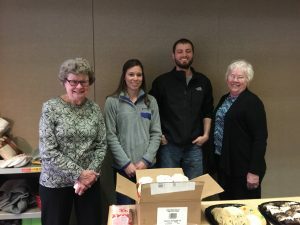 Our discussion continued on the way out, with guests describing the varied weather in the Kansas Flint Hills, rainbows they’d seen, family members who loved forecasting the weather, and long hot summers and long cold winters. To watch our weather wonders, click here. You can also play iconic movie clips that feature weather, such as the joyous tap dancing scene in Singing in the Rain, or the tornado scene in The Wizard of Oz. Dramatic weather photos and pictures can also trigger memories and comments. Thanks to our Cafe Team and thanks for those who visited. 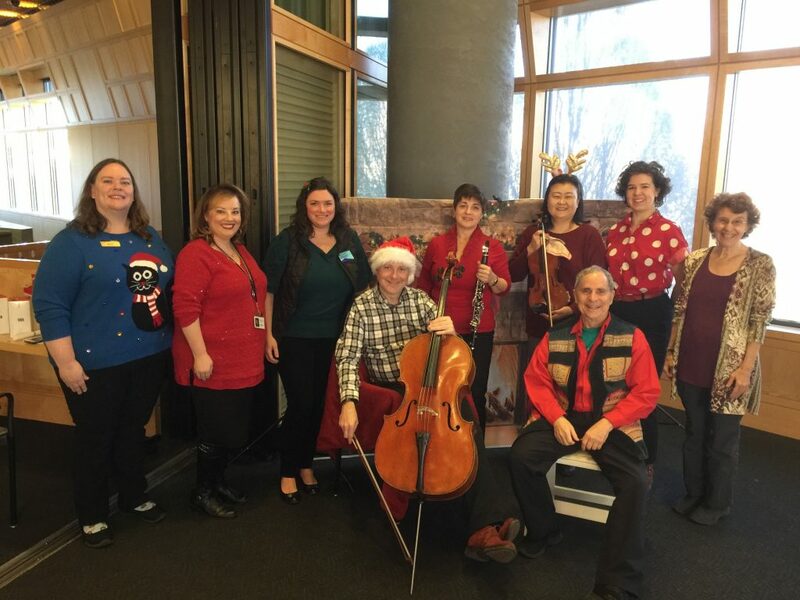 You’ve heard them as part of the orchestra. 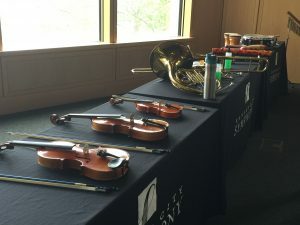 Now you’ll be meeting selected instruments first-hand, as the Symphony’s Margaret Halloin joins us for this delightful interactive session. 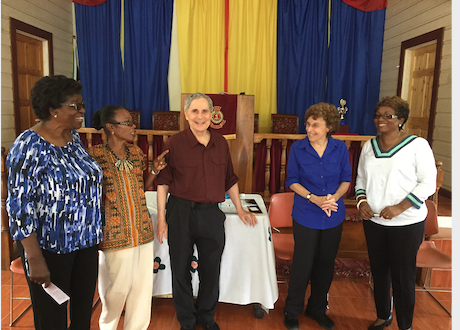 Enjoy refreshments and interesting conversations as we learn more about the sounds of music. 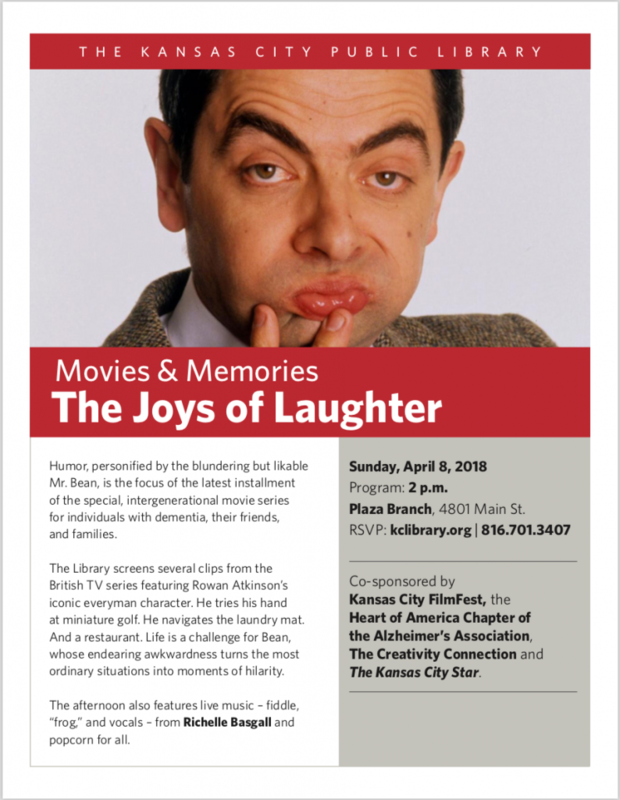 It’s a Sunday morning in early April and we were excited about our Movies and Memories laughter program that afternoon at 2:00. Then, the unthinkable happened. It started to snow, blanketing the daffodils and tulips with just enough flakes to make people want to cozy up at home. 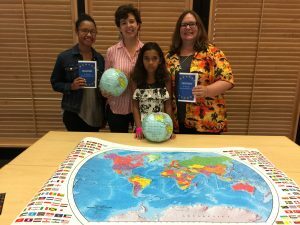 What did we do? Laugh, of course. 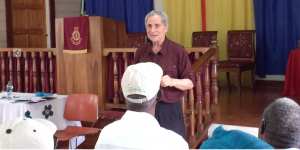 Laughter was the theme of our April program and we had excerpts from the inestimable Mr. Bean to anchor our program. 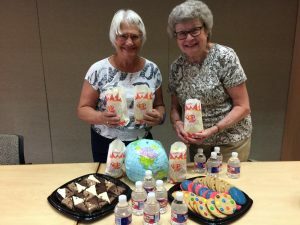 As Emily from the Kansas City Public Library, Plaza Branch, made our popcorn and other library staff readied the technology, we accepted the fact that we might have only our intrepid volunteers in the audience. We all vowed to have a great time anyway. After watching Mr. Bean’s laundromat escapades, we had a laughter yoga session. 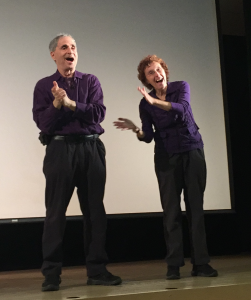 We didn’t have to worry about traditional physical yoga postures—laughter yoga includes clapping, gestures, playfulness, and breathing. Everyone was a hearty laugher and we were all relaxed and smiling as we watched Mr. Bean’s horror as he tried to cope with raw oysters at a fancy restaurant. 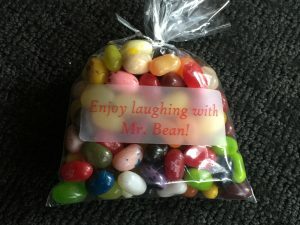 Our ending surprise was a delicious way to take Mr. Bean home— gourmet jelly beans!! Click here for a short video experience. 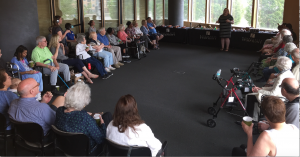 Stay tuned for our next Movies and Memories event in August! 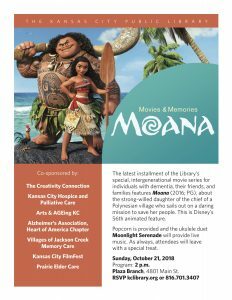 Want to have a movies and memories event right in your own home? 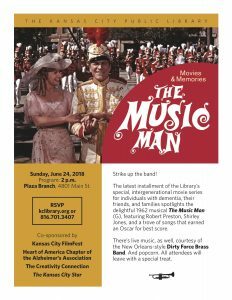 If you’d like to make this an intergenerational experience, select a movie or clips you all might enjoy. Choose a time of day when the person living with dementia will have good energy. Get your favorite movie treats ready. 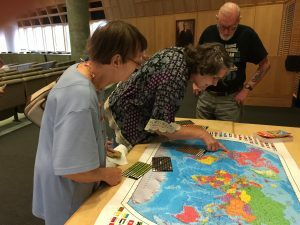 Create times to pause and chat about what you’ve seen. Print out simple jokes as a great way to spread the laughter. If you wish, offer a surprise at the end, either something that reminds you to laugh or smile. And if you like sweets, our jelly beans were a huge hit! With all those flavors, you have a lot to talk about!